This initiative is part of AIReF´s effort to foster discussion and improve communication between policy makers, practitioners and researchers. The idea is simple: a short presentation with potential policy recommendations followed by an open discussion on the main points raised by the speakers. The seminar will be introduced by José Luis Escrivá, AIReF President, and includes two presentations. 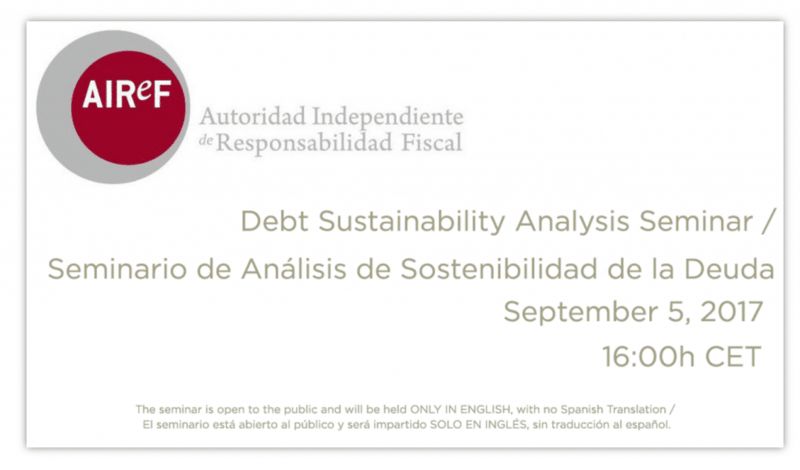 First Enrique G. Mendoza, Presidential Professor of Economics at University of Pennsylvania, will cover his latest research on US debt long-term sustainability. Carlos Cuerpo, AIReF Economic Analysis Director, will act as discussant. Second, Rafael Doménech, BBVA Research´s Macro Analysis Head Economist, will present his work on the key lessons and options for the future that the last recession left in Spain in terms of budgetary stability and structural reforms. This paper will be discussed by Pablo Hernández de Cos, Director General of Economics and Statistics at Banco de España. The seminar will take place in our premises but online streaming will also be available.